Jean Cluade Van Damme is showing his softer side in Wake of Death. He plays a man named Ben who works for some shady bar owners doing some shady things, when he decides to give up the life to spend more time with his wife and kid, but than someone takes this life away from him and you know what that means. It does have plenty of action and suspense: Some good gun play and car chases, and few high kicks of course. 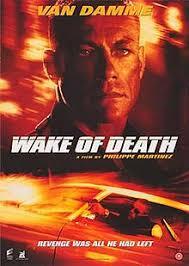 Plus, Van Damme, like I said before was stepping up his game when it comes to the acting.